Personality is the mysterious force that attracts us to certain people and repels us from others. Every product has a personality—whether it was deliberately designed to or not. Reddit is quirky, hyperactive, and sometimes sarcastic. Amazon is like a salesperson with an eidetic memory and amazing talent for statistics. And One Kings Lane evokes a sophisticated, well-dressed interior designer with a carefully curated library of style collages. But sometimes products have unpredictable, temperamental, or multiple personalities. At Weather Underground, where I worked until this May, we realized our website was suffering from personality problems while taking an inventory of all our products and pages before undergoing a design overhaul last year. For example, we used far too many exclamation marks when inviting users to join and contribute to our community (“Welcome! Join the Conversation! Start a Weather Blog!”). And we gave users very little indication when there was an error, much less an apology for it. (Our 404 page said simply, “An error has occurred.”) Overall, Weather Underground came across as unpredictable, awkward, and in need of a lesson on social graces. Weather Underground was the first weather website on the internet, so we wanted our new design to stay true to this history and even strengthen the “weather nerd” aspect of our personality. Yet we also wanted to modernize our visual design and make WU more enticing, welcoming, and friendly. In this moment of designerly tension, we realized Weather Underground’s product personality needed definition, and the best course of action was to articulate a design persona. Unlike a user persona, which characterizes your users’ goals, motivations, and desires, a design persona characterizes how your product should communicate and ultimately build rapport with your users. Both are articulated in terms of a fictional character, but they are used to solve different design problems. A user persona helps you understand your users’ existing relationship to your product, whereas a design persona helps you understand how your product can build a relationship with your users. In this article, I’ll show you how we came to think of our product as less of an “it” and more of a “someone” with an engaging, yet consistent, voice. I’ll also show how our design persona has become a continual source of product ideas. I told the designers that if they found it difficult to imagine Weather Underground as a person, they could imagine how someone similar, like Neil deGrasse Tyson or Bill Nye, would act, and then ask whether WU would act the same or different. Yes. It looks like you’ll need an umbrella today, because there is a 40 percent chance of rain after 3 o’clock. Don’t say a word, just point at a graph. Get out your phone, we’ve got a great app for that! For each reaction, we debated how desirable it was and how true it was to our persona. For example, we realized that WU frequently displays graphs and tables of rich weather data, similar to the example response of “Don’t say a word, just point at a graph.” We decided that it would be much more approachable, friendly, and desirable to provide concise explanations of weather forecasts in addition to the detailed graphs and tables. However, several designers were quick to point out that WU shouldn’t be too friendly—for example, it would be off-putting and distracting to tell a joke when users are looking for the forecast. Answer questions directly, but always back it up with rich data. Speak in a colloquial and friendly tone, but never oversimplify explanations. Occasionally use humor in a conversation, but never in discussing current or serious weather. We articulated our brand traits in a “this-not-that” format, similar to how Kate Kiefer Lee and Aarron Walter described their brand traits at MailChimp, because it allowed us to qualify them against brand enemies. These traits now act as design constraints for all projects, making consistent designs much easier to develop. They also provide heuristics for design reviews, allowing us to critique designs in terms of concrete, established goals. While the brand traits highlight some of WU’s more admirable qualities, they do not identify WU’s approach to specific scenarios. Or, as Kate Kiefer Lee might put it, articulating our brand traits helped define WU’s voice, but now it was time to figure out WU’s tone. As the next step in our activity, we decided to create a personality map. Aarron Walter uses this tool in Designing for Emotion as a way to describe a personality on an x-y axis. On one axis, you have the degree to which the person is submissive or dominant in their interactions. You can think of a dominant person as one who takes charge and presents themselves as an authority, whereas a submissive person would rather follow someone else’s lead. On the other axis, you have the degree to which the person is affiliative or unaffiliative—interested in building a connection, or interested in maintaining distance. Aarron Walter uses the terms “friendly” and “unfriendly” here, but I think “unfriendly” conveys active meanness or abrasiveness, while “unaffiliative” simply conveys emotional or professional distance. For example, your doctor may act friendly toward you, but also make it clear with their behavior and demeanor that it would be inappropriate to ask them out for coffee later. WU should be dominant while discussing the weather, because that is WU’s expertise. WU should be submissive when apologizing for a server outage. WU should be affiliative when discussing interesting weather events that have happened in the past, because we want our users to join the conversation. WU should act affiliative and moderately dominant when introducing educational content, because we want to come off as a nerdy, friendly professor. We realized that people (and design personas) behave differently, and may assume a different identity, depending on who they are talking to and the context of the conversation. For example, your doctor may be dominant and unaffiliative while discussing medical treatments with you, but will become submissive and affiliative while discussing Thanksgiving dinner plans with their grandmother. We are never just one spot on a personality map; our design persona should act differently depending on the context, too. We decided that rather than picking a single spot on the personality map, we would draw out multiple points and context zones. For example, you can see that during “Severe Weather,” we want WU to sound and act like an authority. However, when we have a system failure and end up in the “Apology Zone,” we want to be conciliatory and apologetic. The personality map was only the beginning of our many debates. For the next phase, I asked everyone to think of responses WU would give in specific website scenarios, such as welcoming a new user, telling a user their action was successful, and informing the that user an error had occurred. Each team member contributed a possible response, and we discussed how well each matched the brand traits we had defined and what we knew about our persona so far. Each debate added to our growing library of response examples and taught us more about the nuances of our personality. And while these debates seemed, at times, tedious and narrow, we were actually working through problems in product consistency that we had previously overlooked. We were learning that to have a consistent product personality, we needed to know how WU should present itself across product, design, content, copy, and branding. Now that we had a product personality that we thought would resonate with our user base, we needed to find ways to let that personality shine. For our final design activity, we decided to brainstorm ways to create opportunities. Creating interactions that inspire surprise and delight. Giving users a sense of anticipation. Rewarding users for their continued patronage. We generated no fewer than 35 unique ideas to delight or reward our users, from Easter eggs on Groundhog Day to redesigned 404 pages. One of the simplest, yet most powerful, ideas was enabling our users to thank their local Personal Weather Station owners for their weather data. The implementation details of this functionality are trivial: button click → thank-you message sent. But it has tremendous product engagement potential, because it simultaneously lets users know that their weather data comes from a real human who has generously added their data to the WU community, and thanks those owners for their contributions. The team is currently working on the final details of the PWS thank-you feature and hopes to release it in conjunction with a “PWS Owner Appreciation Day” marketing effort. Another idea that emerged was WunderPosters: artistic posters depicting interesting and beautiful natural phenomena created by one of our in-house designers. We released WunderPosters during Weather Underground’s twentieth anniversary, coupled with a contest where fans could submit ideas and vote on which weather conditions they would like to see turned into a poster. The project spanned departments (design, engineering, and marketing), and has engaged our users over multiple channels. It also speaks directly to the “weather enthusiast” aspect of our design persona. Ideas like these confirmed for us that a design persona is not just about keeping your copy and voice consistent—it also provides a source of design inspiration. Disjointed product personalities can emerge in the best of websites when small, non-technical details are repeatedly neglected over time. But solving your product’s personality problems is as important as solving the technical ones. To start your own personality adjustment, gather a small group of people from throughout your company (including marketing, design, engineering, and product management) and take an inventory of existing copy, iconography, and content. Identify the points in which the tone of your product seems overly dramatic, familiar, brusque, formal, or odd. These will be the initial personality trouble points you solve after defining your design persona. As you go through activities like the ones I’ve outlined throughout this article, try using this worksheet I created to get everyone thinking about your design persona individually before discussing it as a group. WU Brand Traits poster, hung on the back of a bathroom stall. Finally, make sure you record and summarize the insights, decisions, and examples you generate. 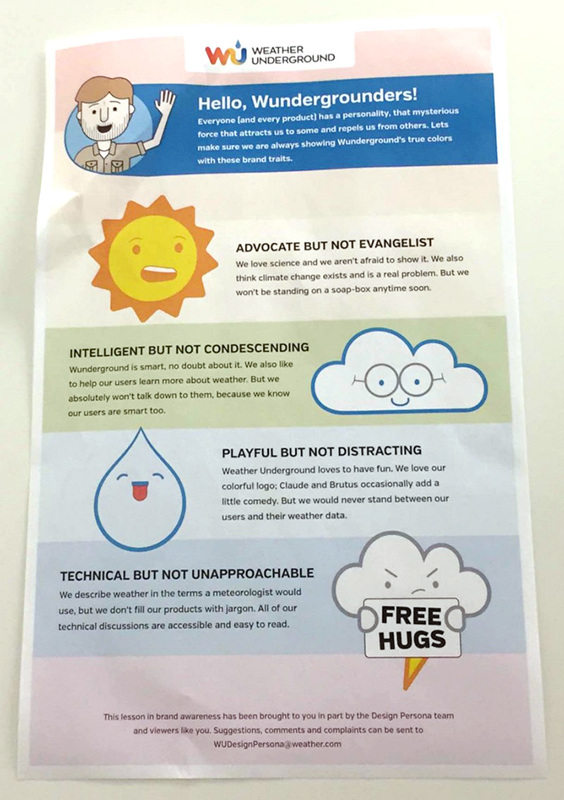 At Weather Underground, we created a WU cartoon figure to represent our design persona and featured him with our other mascots on a series of posters. We then hung those posters in places where our coworkers were sure to see them—such as the back of bathroom stalls. Crafting a design persona is an intense exercise that requires the the time and involvement of team members throughout your company. While the work may seem daunting, it is well worth it. By investing in your product’s design persona, you are investing in future advocates of your product—and creating a source of design inspiration for your team. The web is a record of all you share (and over-share). So why would you risk looking less than perfect right where potential clients will be getting to know you? Because it’s also the best way to show them how honest, hardworking, and reliable you are—and helps you connect with people who can fill in gaps in your knowledge and sympathize with your ups and downs. So how do you find the right level of openness that can actually help your business? Meg Dickey-Kurdziolek is a UX researcher/designer. After spending many years in the Bay Area, she now calls Pittsburgh, PA home. Meg is also a proud alumnus of Virginia Tech, where she received her Ph.D. in human-computer interaction, and would have become a professional student if that were a legitimate career choice. Thank you for an excellent article in the process of learning to code it had never occurred to me to consider the website personality. Something to know add to the mix has I construct my first website. An excellent article with a real world example of how designing with a persona in mind was implemented. Now I want to read Walter’s book! I usually choose WU over the other weather sites because I like the combination of the slightly disorganized friendly feel with a geeky science aesthetic. Hate the slick corporate style of other sites. I imagine the people behind the site as wanting to offer just the facts with a bit of interesting extras and no need to impress with how wonderful they are. Thank you so much for the comments! Bernard – It is definitely worthwhile to outline a design persona at the beginning of a project. I imagine it will help you generate new and unique ideas for your website – not to mention help you write all the copy needed. Chris – I (obviously) really recommend Aaron Walter’s book! Jean – Thank you for the WU love. Your characterization of the people behind the site is spot-on. Awesome article. Every product has a personality.. this is such a beautiful way to explain the concept of the key components of a website. I agree with you that for developing a perfect design of a website people from all departments should be involved. Thank you for this usefull article. I like the way of your explanation of individual personas. i also agree that the design needs to fit to the users. Thank you for this usefully article. I like the way of your explanation of individual personas. i also agree that the design needs to fit to the users. Thankx for this article with a real world example of how designing, we can learn from this! Aarron Walter – wise man 🙂 good post! Hi Meg. This is such a great post. By considering branding in this way actually makes it much easier to consider how it might look, feel, act etc, and allows for some really original, out of the box ideas. What would you suggest as the best way(s) to document this, and communicate with teams working on the brand? @Ian – good question! I think Design Personas (like other types of personas) don’t do well when they just live in a slide deck or something static like that. I’ve found that is less about documentation, and more about having reoccurring “events” or triggers that make you bring the Design Persona into the room, so to speak. I recommend having a cross-discipline team of people who serve as the Design Persona advocates throughout the company. They can spread awareness and make sure that the design persona gets inserted into the process at opportune times. They can also meet regularly and have periodic workshops to reinvigorate the design persona when needed. Would you mind if I sent the worksheet to some of my clients that I work with? I’ll obviously keep your credit on the document but I really think this will help me create a much more powerful design that works for their brand – thanks so much! Re: sharing the worksheet – Go for it!